New for this week, Chibitronics Circuit Stickers, check out the demo video. Hello everyone, I'm back to talk to you all about the new stuff we have for this week. We have a new type of product this week, so let's dive right in and talk about what circuit stickers are. In addition to the starter kit, there are also add-on kits. The LED Effects Add-On Kit provides you with five unique stickers to make your LEDs blink, twinkle, and generally effect the way you experience them. 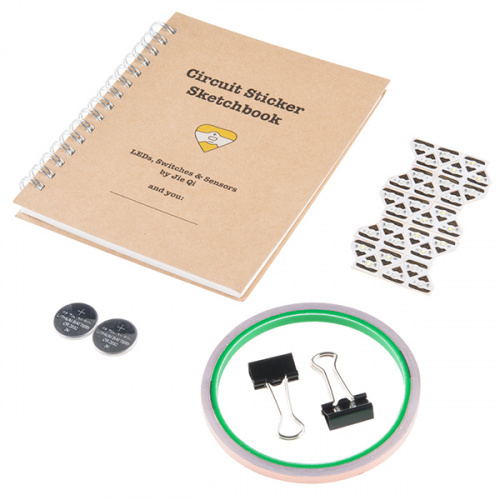 Each kit features one twinkle, heartbeat, blink, and fade circuit sticker and adds their respective effect to your paper circuit project. 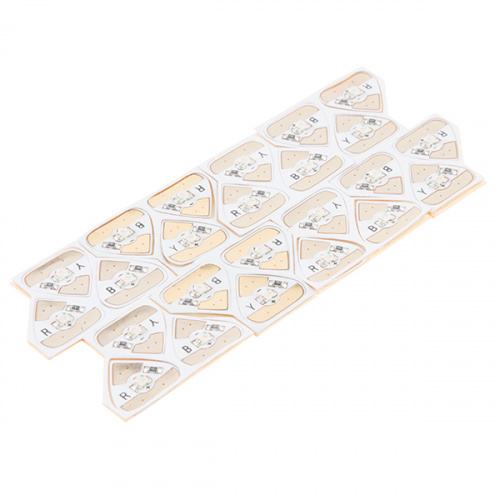 Like the LED stickers you won’t need to worry about any soldering, sewing, or coding. Just peel, stick, and you’ll add some awesome effects to your LEDs in no time! The Color LED Add-On Kit is a set of 24 individual red, yellow, and blue LEDs that offers a conductive adhesive backing that can be attached to just about any surface and powered by a simple coin cell battery. That’s right, no soldering, no sewing, and no coding. Just peel, stick, and you’ll have a set of glowing white LEDs in no time! 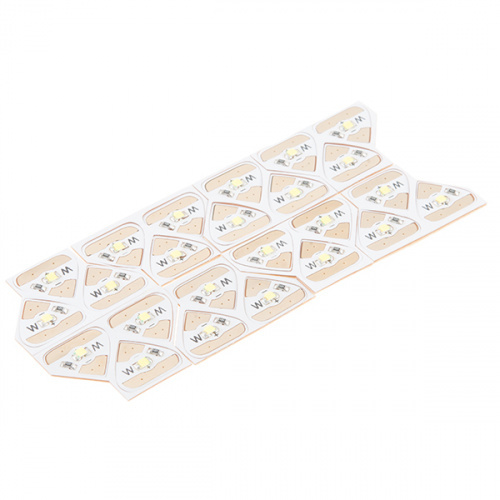 Lastly, the White LED Add-On Kit includes 24 white LEDs if you don't need the colored pack above. Be sure to check out the Chibitronics Learn Page for tutorials, videos, and multiple projects. That's all we have for this week. We have lots of new products in the works, so be sure to check back next week, we'll have something new for you. The next month or two will prove to be pretty cool for new stuff, so be sure to check back. Thanks for reading! OK, this is going to sound kinda dickish but I feel we should be in in an honest relationship. Being honest would be nice. At this point I'm convinced they're just not doing Friday new product post videos anymore. That's fine, but be upfront about it! We've been hearing they'll be back soon for weeks now and this post didn't even address it. Basically what the situation boils down to is this - the new product videos featuring Rob are not gone. But Rob has a full-time job as SparkFun's Product Manager - and, believe it or not, filming and preparing for the product video takes quite a bit of time. In many instances, it's easier and much more efficient for Nick, Shawn or Sarah to do the videos, as they are the ones building 99% of the demos that appear in the videos. Rob will certainly be back for some videos, but you're definitely going to be seeing more of Sarah, Shawn and Nick's smiling faces. They work really hard to build awesome demos of our new gear, so we hope you'll learn to love them like you love our bearded compatriot! +1 I look forward to coming here on Fridays and watching the new product videos, but they've been pretty meager ever since the move into the new building (so several months now). Artsy demos and consumer-friendly soundtrack. Looks like Fridays now cater to the lowest common denominator as oppose to the geek/tinkerer. We're a few episodes away from an typical Apple commercial. I miss Rob. I have to admit, I come to this site every Friday for the video. Its ok once in a while to do a write up when things are thin, but the video is more than just seeing the product. The demo's and comments really make a difference. Oh and its completely OK to bring back old product and re-introduce us again. Sometimes we forget some of the cool things we havent seen in a while and now have a new application for. We want more circuits to go where no circuits gone before.../Sparkfun ? Rob= Off to do his part in " Vikings" (HBO)? Super cool, I use the stickers for greeting cards often. Would love to see more colors stocked! Very fun! kids would love to do this for a Christmas poster or happy birthday sign or anything! I agree! And they are very easy to use and can be small and compact when combined with a small battery. The stickers have resistors included on them so really you just have to stick it and it all works! Friday Product Post: Yes We CAN!